The innovative Snag Proof Strain Relief is designed specifically to be crimped with the EZ-RJ45® plugs. The primary strain relief of the plug locks the snag proof strain relief in place so they will not pull off, creating one, integral assembly. Once crimped, this design allows the plug's primary strain relief to relax slightly, preventing the cable pairs from being over compressed. This decrease in stress contributes to achieving peak performance. 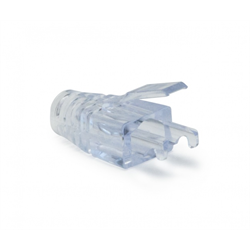 The tab on the strain relief is designed to extend over the plug's locking tab, making it snag proof when administering patch cords. Same as part# 10035C (clamshell package) only in a bag.